Why not join us for a very special Easter Sunday? We will be serving R&J’s Signature Salt Aged Beef Rump Roast, along with locally reared Pork and Crackling served with all the trimmings. We also have a number of other delicious treats for those who don’t fancy a traditional roast and to make sure it’s an occasion the whole family can enjoy children’s portions will be available. 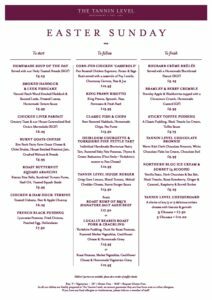 Take a look at our Easter Sunday menu and call 01423 560595 to book your table. We look forward to welcoming you to The Tannin Level!